We actually built this one a while ago, specifically as a response to this Reddit post. Implementation took a bit of work but was relatively straightforward. We were surprised to learn that all the actual sphere mapping/positioning information was stored as metadata inside the JPG, and that you were expected to use a bunch of Adobe custom libraries to read that data. That took a day or so. Once we had the data, we needed to create an appropriate sphere model with reasonable mapping, and write a shader that properly offsets everything using those instructions. That went fairly quick, though getting the camera to behave well while respecting the bounds of the image took a few tries. All told we had a largely working project within a couple days. The real problem is, I wanted to include some default images. If nothing else, I needed one for the Play listing. I make a point of staying legal for things like that, and normally I'd either ask an artist to make something, or maybe browse some stock photo sites and look for good images we could get rights to... but we can't really do that here, as it's a fairly new feature and you can't find them on the usual photo sites. The nature of the image makes painting one rather non-trivial, too. So, I started contacting folks who had good ones (mostly on Google+) asking for permission to use their images, and mostly got ignored -- I'd imagine I sounded like a scammer or something. 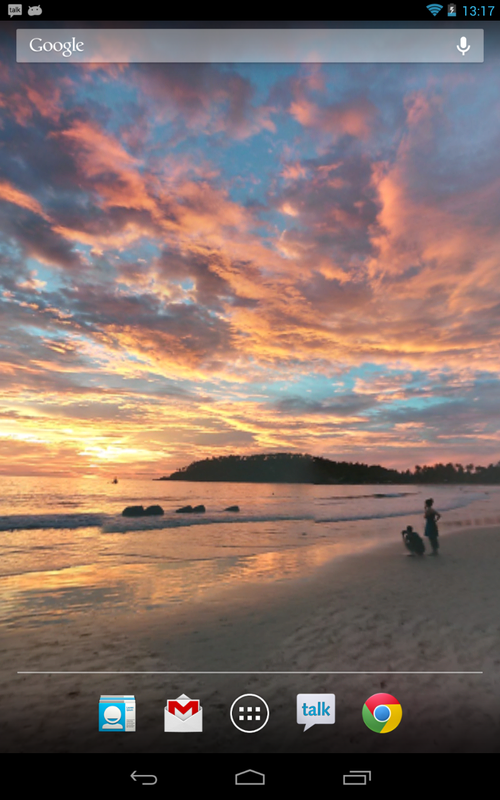 Eventually I came across an excellent beach image by Kevin Flannery and he kindly granted permission to include his photosphere in with the product. It's just one, but it's enough to make the market listing and have something sane looking when you first run the product. This is currently a relatively lean product, so we've got a fully-functional free version up. As Photosphere support gets bigger ideally we can hook in some additional functionality and have a paid version as well. We'd love to have Picasa integrated, for example, once they have a way to filter to Photosphere images. For now though it works, should handle any photosphere on any device, and I hope everyone enjoys! The ability to tap into the gyroscope and move the image around almost like the street view app. I would also love the ability to make the camera spinning at all times slowly. So even if I just stay on my main home screen, I will see my entire sphere. Thanks again for the app! 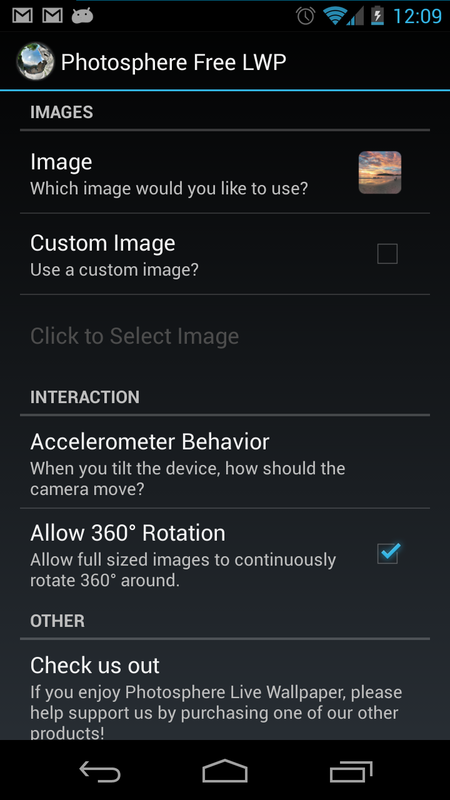 Haha I am dumb.. Just realized that I have been unknowingly setting my accelerometer to invert and that is why it was backwards.. For some reason I thought that setting was for specifying where the default height was.. On some spheres I want to be looking up at zero and some down at zero.. If that makes sense..